In 1904, the building of a planned community began, and the Henry River Manufacturing Company started producing fine cotton yarns in 1905. In its time, Henry River Mill Village was a completely self-sustained town: it operated under its own currency, generated its own electricity, and churned its own moonshine. While the mill thrived during its operating years, the 12-hour shifts often proved backbreaking for workers. By the time the 12,000 spindles slowed to a halt in the late 1960s, many workers had hoboed out of town looking for higher wages. The mill itself burned down in 1977, but the two-story company store and many of the workers' houses remain, creating an eerie silhouette—and serving as inspiration to both artists and filmmakers. Writer Nicole Callihan, whose grandmother grew up “on the hill,” combines forces with longtime Henry River resident Ruby Young Keller to create this compelling account of a mill village turned ghost town turned Hollywood movie set. 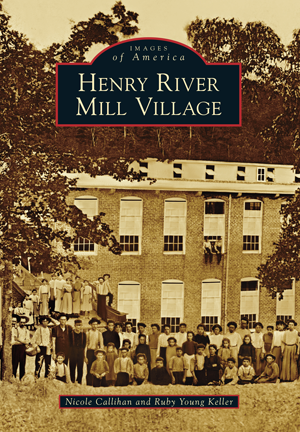 With stories and photographs gathered from former residents and their families, Henry River Mill Village emerges as not only a rich account of the North Carolina textile industry, but as a true testament to a community that flourished even in hardship.